Symptoms such as tinnitus can be caused by ­damage and diseases that affect the conductive apparatus of the ear, its receptor organs, the auditory nerve, and nerve cells in the nuclei of the auditory system, including the cerebral auditory cortex. Tinnitus can also be caused by activation of neural plasticity (causing plasticity diseases), which can cause altered function at the cellular level in the brain and re-routing of information. The brain is not a fixed system but it is continuously shaped and re-shaped by signals it receives from the outside world. Neural plasticity is a property of the nervous ­system that becomes apparent only when turned on. Activation of neural plasticity can be beneficial or harmful. Activation of beneficial neural plasticity facilitates recovery from damage to the nervous system (such as from strokes). In sensory systems, it may serve to compensate for loss of function or to adapt the nervous system to change in demand. Expression of neural plasticity can make the nervous system adapt to changing demands (prostheses such as cochlear and cochlear nucleus implants). Activation of harmful neural plasticity is involved in creation of symptoms of disease (plasticity ­disorders) such as some forms of tinnitus, central neuropathic pain, and some forms of muscle spasm. Reorganization and re-routing of information in the central nervous system. Change in the balance between inhibition and excitation. Increased synchrony of activity of single nerve cells. Increased temporal coherence of activity in populations of nerve cells. Deprivation of input, overstimulation, injuries, and unknown intrinsic factors can promote expression of neural plasticity. Many forms of tinnitus are phantom sensations caused by activation of neural plasticity and similar to phantom sensations in other sensory systems causing central neuropathic pain, paresthesia, and spasm in motor systems. Many forms of tinnitus are associated with changes in processing of information that may involve hyperacusis and distortion of sounds. Abnormal (pathologic) changes in connectivity may occur because of activation of neural plasticity that opens (unmask) dormant synapses or close (mask) synapses that are conducting normally. Activation of non-classical pathways is an example of change in connectivity. 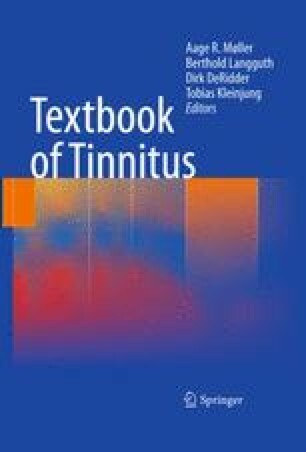 Tinnitus is often accompanied by cross-modal interaction, which may be explained by an abnormal activation of non-classical sensory pathways through re-routing of information. Involvement of the non-classical pathways may explain symptoms of mood disorders, phantom sensations, improved perceptual capabilities, or atypical sensory experiences that often accompany severe tinnitus.